As watered and dumbed down as an American style chain of bean slingers could ever be, “gourmet burritos and tacos and barbacoa” restaurant Chipotle has now opened here in London. The self described Mexican grill is a comfortable enough spot to slide into for a quick bite. During our visit, counter service was friendly and efficient while constructing the day's “featured” burrito for us. The ample and sturdy wrap of higher welfare chicken (whatever that means) with coriander-lime rice, pinto beans, roasted chilli-corn salsa and sour cream set us back £6.60, which seemed pretty good value given the Central London location and the quantity of food. Did we like it? Sure. But we wouldn't go so far as to say we loved it. Will we return? Well, stranger things have happened. Such swift and smiley service could possibly come in handy when hungry and in rush. Still, there are better (and, to be honest, much worse) Mexican style options in town. 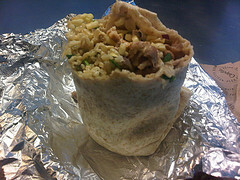 Chipotle is located at 114-116 Charing Cross Road (WC2H 0J). Visit 'em online at www.chipotle.co.uk.